Summer is about being out side is your Outdoor Kitchens ready for the heat? 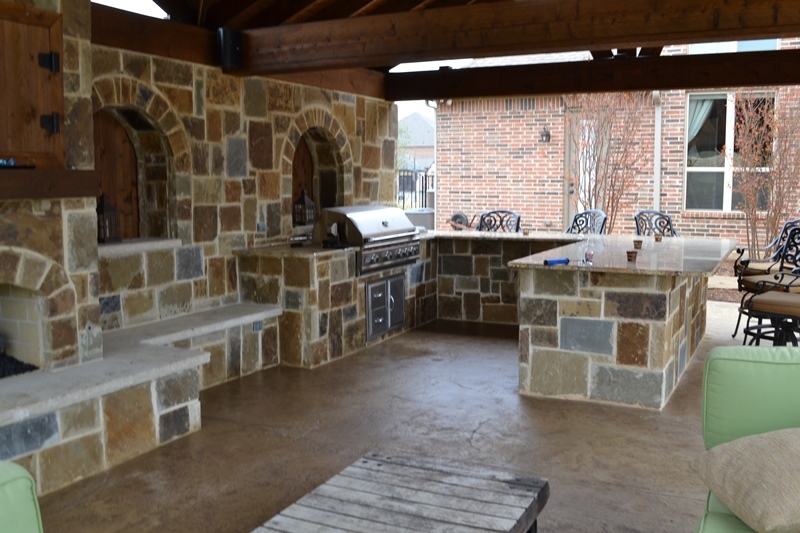 Warmer weather is upon us in Allen, and that means it’s time to fire up those outdoor kitchens. So, you took the time to winterize your investment against the winter cold. Getting ready for the outdoor season is just as easy as that. It’s best not to wait for your first party of the year. Do it now so you know everything remains in good working order. Turn the power on. Make sure that your refrigerator will get a bottle of drinking water to a refreshing 42 degrees within 12 hours. If it won’t, have it checked out. It may just need some cleaning around the condenser coils or some refrigerant. Many of the outdoor kitchens that we’ve installed around here have ice makers. You should make sure they work too. What a great excuse to enjoy an early glass of lemonade! Take advantage of the friendliness we enjoy here in Allen, and invite a few neighbors to have a glass with you on our next warm day. Even though you cleaned your countertops before covering them, you’ll probably notice they need to be cleaned again. This is due to condensation that builds up over the winter months. Use the proper cleaners. Stainless steel countertops will shine up quickly with a few sprays of stainless cleaner. Check how much propane you have. You want to have enough to last for a few weekends, for starters. Hook all your tanks up and fire up your gas-burning appliances. They should burn with even heat, and there should be no weird smells. A rotten egg smell indicates a propane leak. Any other strange smell may mean you have a bad gas-air mixture. For a bad mixture, check your owner’s manual to see how to make the adjustment. If you have an outdoor fireplace or pizza oven, make sure your wood made it through the winter. If it looks too wet or dry, go ahead and fire some up. If it’ll work, that’s great. But if you need to get some more, it’s best to stock up before you actually need it. Ditto for propane. How have your cushions held up? If they got soaked, it may be a good idea to replace them. Look for cushions made of closed-cell polyurethane. Water basically runs through this type of foam. Good closed-cell foam never gets wet. Once you have your outdoor kitchen in order, take a look at the landscaping around it. The kitchen’s appeal draws from it. Fix any loose stones, pull cool-season weeds, do some edging and make the whole area looks sharp and groomed. Opening your outdoor kitchen for the year signifies the start of patio season. It’s our favorite time of year! Get started now, and enjoy the warm weather. For further information, or to schedule an appointment with Eric, simply call Scott Design & Construction at 972-562-9467. You may also write to us at P. O. Box 836, Allen, TX 75013 or use the convenient online contact form. Let our two decades of experience in this industry help you showcase your home and grounds to great advantage! Summer is almost here, how is your yard looking? Scott Design & Construction was founded in 1989 by Eric Scott. What was started by a teenager as a small lawn service has evolved into a full service landscape and construction firm that transforms properties into exceptional outdoor rooms and gardens.